CFP: 11th Circuit Issue, U. Miami L. Rev. 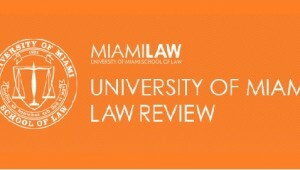 The University of Miami Law Review invites submissions for its annual 11th Circuit issue. The submission deadline is Feb. 1, 2015; earlier submissions are given priority. Every year, the University of Miami Law Review dedicates its fourth issue to articles analyzing current and timely issues pending within the Eleventh Circuit. The Eleventh Circuit issue is unique to the University of Miami Law Review—no other journal publishes an issue like it. As the premier publication for law review articles regarding the Eleventh Circuit, past issues have either provided broad overviews of relevant topics or focused on a single, relevant theme.